This page highlights many of the rockets that I had growing up, in a more-or-less chronological order. Not every single model is included, but mainly those I consider significant in some way or ones connected with especially fond memories. 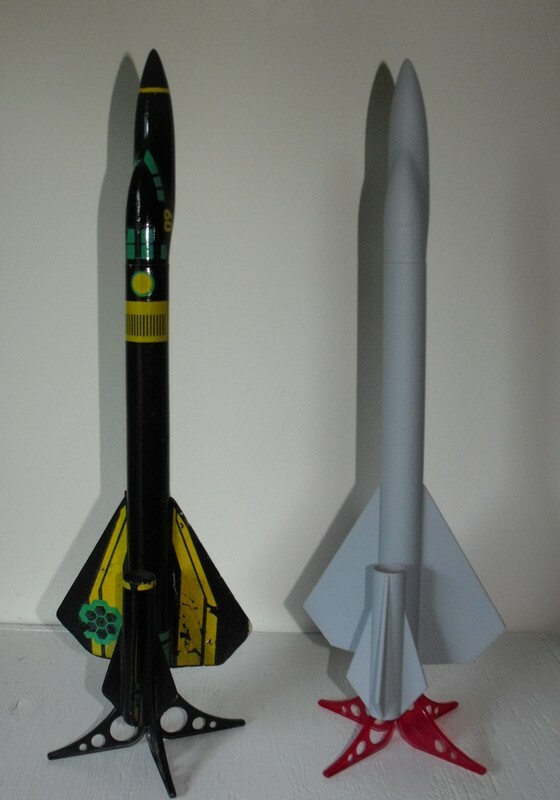 Not only do I credit my dad for introducing me to model rocketry, but both of my parents are very much to thank for the assembly, painting, and decal work of all of the earlier kits that were given to me. Considering the complexity of some of those models, it says a lot about my parents’ dedication to encouraging their kids’ interests. The following entries are incomplete. This page will be updated as time allows. The flight of my dad’s 3-stage Farside, in addition to the first space shuttle flight, was a primary source of inspiration for a life-long interest in rocketry. My earliest rocketry memories are of my dad showing me the unpainted kit and demonstrating the staging sequence when I was only four, then the flight at a local school. See more information about this and subsequent Farside builds on our Astron Farside page. After years of wondering, I only recently (2013) discovered the identity of a second rocket from my earliest childhood fleet which may or may not have flown the same day as the Farside. I always remembered fondly (but vaguely) a larger diameter long rocket that my dad had painted orange and black (and may have left the nose cone white and painted black circumferential stripes on it–yeah, I know the stripes sound weird, but my dad once hand-painted brown stripes around an orange Mosquito, so it wouldn’t surprise me if my fuzzy memory is correct). I don’t have any memory of the Renegade flying (I’m pretty sure it did fly at least once), but I seem to recall hitting my younger brother with it like a sword at some point (Estes body tubes aren’t strong enough for that, by the way; I don’t recommend using them for make-believe sword fighting). 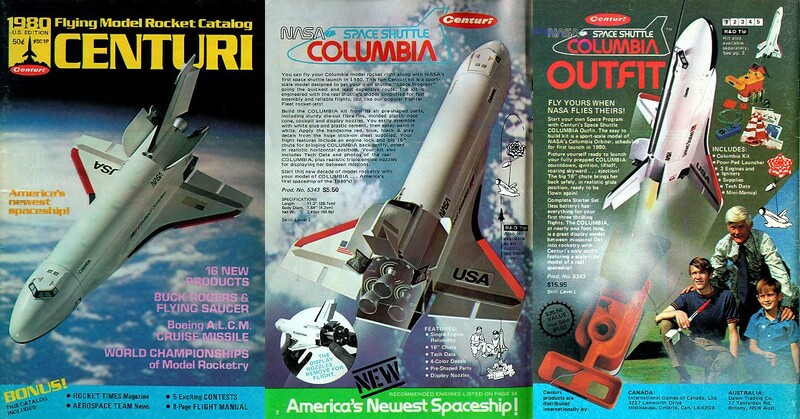 The Centuri Space Shuttle Columbia was the first rocket kit that my parents bought especially for me. The first one flew with an unpainted brown body tube, but the wings were white fiberboard and decals were adhesive-backed paper. We flew it behind our apartment and promptly lost it in a tree, though I think the body was eventually recovered after separating from the shock cord (due to rain/moisture). At some point not long afterward a replacement kit was built. This time it was painted (see photo). I don’t recall if the second model ever flew; I may have used it solely as a toy and for display, and it was likely destroyed by rough handling. 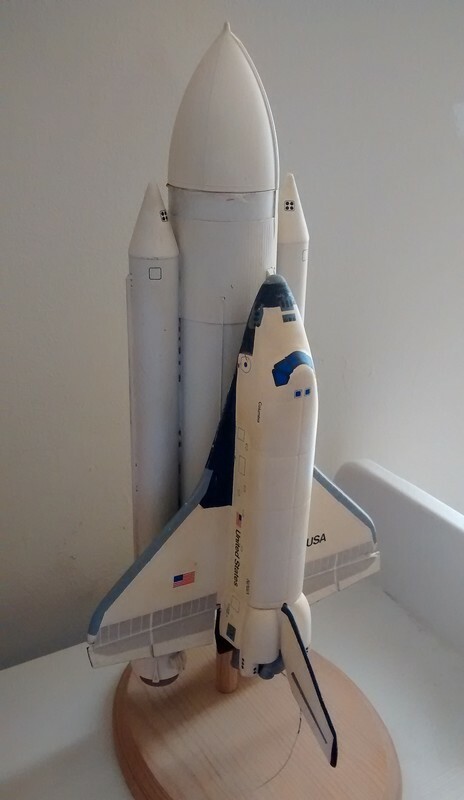 That kit is probably one of the oddest and least accurate shuttle models ever created, but I have very fond memories of it and would love to own another. Some interesting things about it: the cockpit was a thin vacuum-formed piece of styrene that had to be cemented to the stock nose cone, and the OMS pods were represented by flat fiber fins. Scans of instructions and templates are hosted here courtesy of Tim Morley. This was the first model I acquired after moving to South Carolina halfway through kindergarten. My Sky Hook was painted Testors Competition Orange with a flat black nose cone. I kept the nose cone for several years after the body was destroyed. I’ve always liked this simple “classic” rocket style (note the similarity of outline relative to the upper stage of the Farside–probably a connection there). This rocket is an old favorite that I still keep on a shelf. Despite drawing payload bay lines in thick magic marker as a kid, it still looks pretty good and has flown a few times in the last decade. This model has always had a very graceful flight profile, especially in the coast phase; it always seemed like it wanted to try to glide prior to parachute ejection. I’m fortunate that it never got lost or destroyed while growing up. 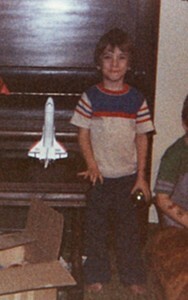 This is the oldest rocket of my childhood fleet that is still in my possession. The Nova Scout Ship is the only other rocket (besides the Space Shuttle Columbia) that I still have from early childhood and is also an old favorite. I believe my mom did the bulk of the work on this one. I was also very interested in the Star Ship Nova thanks to prominent image placement in an older catalog, but by the time I actually wanted to find one, it had already been discontinued, although I did get a copy of the Star Ship Nova instructions by writing to Estes. I began building a replacement model not that long ago since I had an old nose cone available, scavenged from a damaged Nimbus kit. I redrew the decals in TurboCAD, so they’ll be ready to print when the time comes (I shared my decal file for both model designs with Mark Hayes of Stickershock, so you can probably get printed or vinyl decals based on my files). 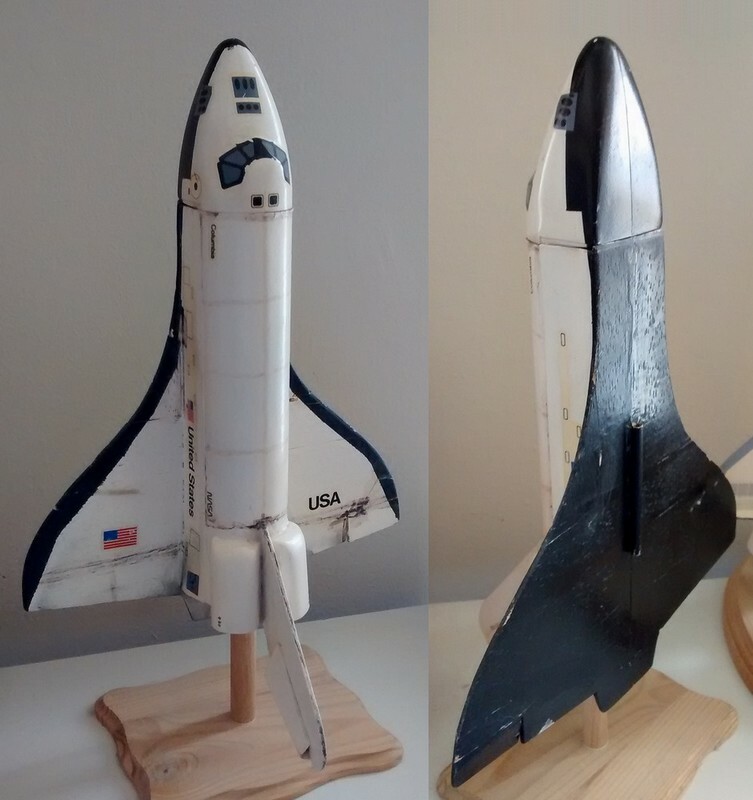 I thought this shuttle model was the coolest kit ever from the first time I saw it. My dad was the coolest guy ever for dealing with building it (the vacuum-formed parts can be a real pain). On one of its early flights we lost the tank/booster section to power lines. Thankfully, the shock cord separated and the lower half returned after some rain. My dad replaced the nose with a drill-turned balsa one (it was a bit lopsided, but it worked for us). On a another flight the whole stack crashed, crimping the top of the E.T. body tube a bit and crushing the orbiter’s delicate nose. Eventually I was able to fix it with glue and putty, restoring its flight-worthiness. The cockpit decals had to be replaced with hand-painted ones due, I believe, to some unrelated incident. I ended up building this kit again myself when I was 13-14. This second model is still in working condition (see recent photo), though I had to repair the motor mount after a minor crash around 2003. 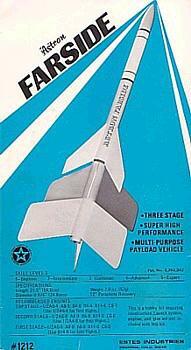 This was the first rocket kit that I most clearly remember finishing by myself (I may be forgetting others). I recall the fin unit decals giving me extra trouble at the fin roots, leaving a decal bubble “fillet” at every joint. Mine was painted Testors Competition Orange rather than the red displayed on the kit card. The Scorpion probably flew more times than all the other kits I had growing up and was a tough, good-looking bird. We typically flew it with a streamer for easy recovery (the kit came with parachute), but we lost the upper stage around 2003 at a snowy launch with SEVRA. Simple rocket, but significant loss. I have plans to rebuild this one, possibly simulating the one-piece fin units using 3D-printed parts. Our fleet just seems incomplete without a Scorpion on display. Rockets are just cool enough as a family activity that my brother Aaron and sister Rebecca got into the action, if in a minor way. My brother’s first rocket was the Viking, a small BT-20 rocket with fiber fins and multiple fin layout options. His was painted copper, which looked nice with the bare red plastic nose cone (see photo at the top of the post). 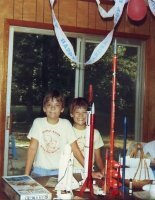 He also built a custom metallic blue rocket from my Designer’s Special, then a few years later a Der V-3 kit, which I still keep. Rebecca had a BT-5-sized Sparrow kit which was painted ruby red with a silver nose (see photo) and later a Gnome (pre-colored chrome and blue). I recently gave her a replacement Gnome that she can fly with her kids.